I have a lot of time for slightly quirky skincare products and the DHC Quick Film Smoother is no exception. I also like the no-nonsense approach DHC took to naming this product - Quick Film Smoother. It's designed to make an instant 'improvement' to the look of your complexion, it creates a kind of film over the skin and it smooths wrinkles in one fell swoop. Pretty much does what it says on the tin then really. 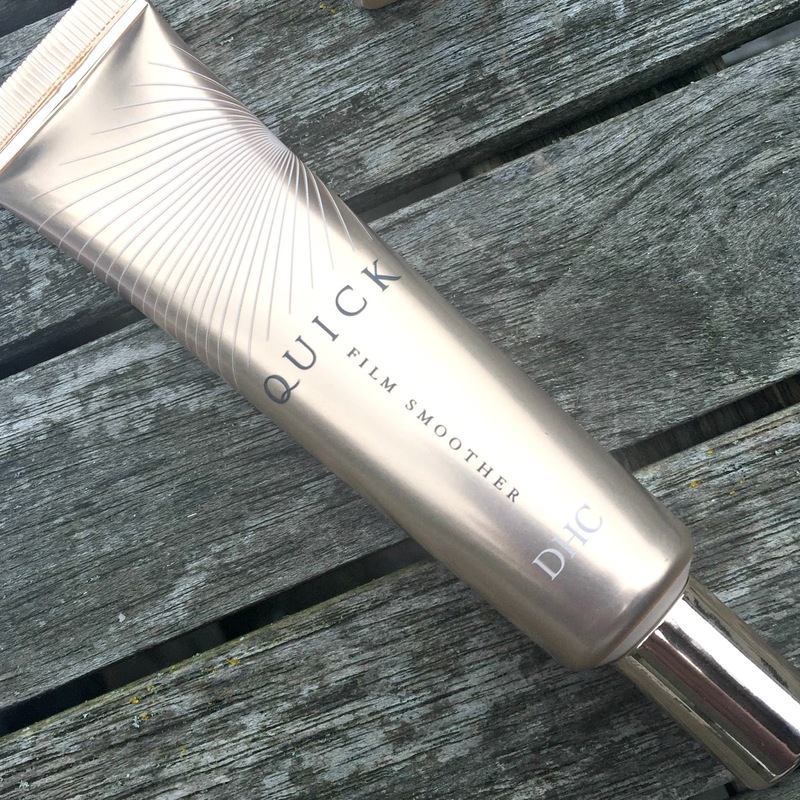 The Quick Film Smoother is a skincare and makeup product in one as it provides an immediate smoothing effect and delivers a dose of ingredients that work over time. Particularly brilliant as a primer, Quick Film Smoother is a lightweight gel-cream formula that works instantly to smooth out wrinkles. This effect is thanks to the addition of egg shell membrane peptides that are rich in collagen- they provide the 'tighten and lift effect' that the Quick Film Smoother provides. Various derivatives of the humble egg seem to be a popular ingredient in East Asian skincare so it's not really surprising that DHC include it in this product- I myself haven't tried any skincare containing egg before (though I have had my fair share of egg on my face ha ha ha...) but trying this product has certainly piqued my interest in the power of the egg as a cosmetic ingredient. While the egg peptides provide the immediate effects, skin is nourished and moisturised by algae extract, Sodium Hyaluronate (a water-soluble salt form of Hyaluronic Acid) and soy protein. As mentioned, this is brilliant as a primer and I'd say it would suit pretty much every ski type. It doesn't have a heavy, artificial, silicone feel on the skin and just provides a nice smooth base ready for foundation. Or it can be worn without foundation if you don't fancy getting made up but would like a little glow action. DHC Quick Film Smoother is on special for £17.50 at DHC until February 28th. After this date it will return to its full price of £22. You can also find DHC at Escentual.